Last week was a busy week in USA. 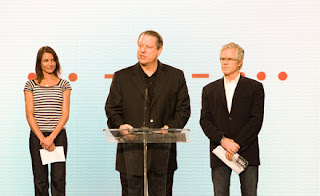 First off was Al Gore's announcement of the launch of Save Our Selves - the Campaign for a Climate in Crisis. The SOS Campaign will be spearheaded by a 24-hour concert on 7/7/07 across all 7 continents that will bring together more than 100 of the world's top musical acts. Television, internet and wireless coverage has already been secured in 120 countries, with more to come. Live Earth concerts will take place in the Brazil, Shanghai, Japan, Johannesburg, London, Sydney, the United States and Antartica. It is designed to trigger a global movement reaching people in every corner of the planet through television, film, radio, the Internet and Live Earth. The Live Earth audience, and the proceeds from the concerts, will create the foundation for a new, multi-year global effort to combat the climate crisis led by The Alliance for Climate Protection and its Chair, Vice President Al Gore. Live Earth are not only issuing a rallying call to the world but are also ensuring that they do so sustainably. They will be implementing a new Green Event Standard that will become the model for carbon neutral concerts and other live events in the future. Next up over in Washington, by way of a response to the none too productive United Nations climate negotiations in November, the British-led Global Legislators Organization for a Balanced Environment (GLOBE) set up a meeting in the hope of stimulating progress in a less formal setting. The two-day meeting brought together legislators from the Group of Eight industrialised countries - United States, United Kingdom, Italy, Germany (current president), France, Russia, Canada, and Japan - plus Brazil, China, India, Mexico and South Africa. And indeed, although no decisions were binding, progress was made with the expectation of influencing the 2012 Kyoto Protocol succession plan (GLOBE have launched the G8 + 5 Climate Change Dialogue). Delegates agreed that developing countries will have to face targets for cutting greenhouse gas emissions as well as rich countries and a global market should be formed to cap and trade carbon dioxide emissions. The Americans were in an upbeat mood too with Senators John McCain and Joe Lieberman supporting legislation limiting US emissions. One Englishman who attended both events was Steve Howard of The Climate Group - an independent, nonprofit organization based in London dedicated to advancing business and government leadership on climate change. To see a short video of him speaking about what action needs to be taken now, see Green TV.